Thrilling….to be on the dance floor in North America with hundreds of people dancing tango. A floor so immense it never actually looked really crowded. Tons of dancers dancing and trying to stay in some kind of lanes. People moving in completely different styles but respecting the available space and moving in a soft way. This was delightful. The vibe, energy, mood was great. Everyone looked like they were truly enjoying themselves. Lovely!! Here is a clip of the ronda featuring the Festival Instructors….showing a great deal of enthusiasm and fun in this Canaro milonga. I also had the great pleasure of working with Paul Akmajian as guest teachers at the festival… and enjoyed our classes, as always, very much. This entry was posted in Isabella Szymonowicz, tango argentino, tango milonguero. Pam and John … founders of We Tango … are taking some time off and luckily a few friends of mine gently suggested that I should offer to help them out. To my surprise the ever gracious couple have taken me up on my offer and here I go again … back at Swansea Town Hall. 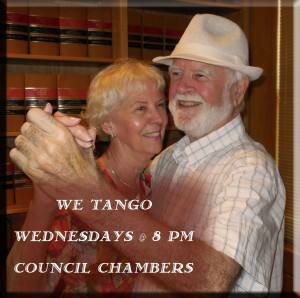 Please join me on Wednesday nights, from 8p.m. to 10:45p.m. to share some beautiful music, friends and “charla”. This entry was posted in DJ Isabella Szymonowicz, Isabella Szymonowicz, tango argentino, tango milonguero, Toronto Tango.